Hailing from our very own Ville Platte, Louisiana, “T-Sale” consists of brothers Jean-Jacque & Louie Aucoin, grandsons of the late, great Cyprien Landreneau. They are well known at festivals and events and gain a potent connection with their audiences by blending the very essence of modern day Cajun music with rediscovered classics by artists such as Cyp and Adam Landreneau, Nathan Abshire, Dewey Balfa, Iry Lejeune, and more. Their self-titled CD includes that very mix and is sure to be a favorite in your collection. So here comes another Cajun band from Lafayette, Louisiana! On second thought change that to here comes another talented and exciting Cajun band from Lafayette, Louisiana with an incredible debut CD. 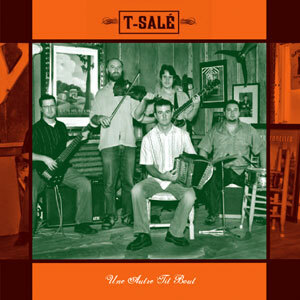 T-Salé (translation = a little salty) is a quintet of musicians that pride themselves on interpreting traditional Cajun classics by such luminaries as Canray Fontenot, Dewey Balfa, Cyp Landreneau, Nathan Abshire and Iry Lejeune. In the process they deliver some of the most exciting sounds I’ve heard on a Cajun CD in a long time. The do justice to the Cajun tradition and make these composers proud. 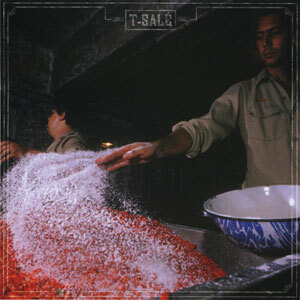 T-Salé is as hot as the peppers being salted on their CD cover. Maybe it’s because front men Jean Jacques and Louie Aucoin are the grandchildren of the legendary Cajun songwriter Cyp Landreneau that this music is in their genes. Whatever the reason, T-Salé makes Cajun music exciting. Among the 14 exhilarating tracks featured on the CD are some real standouts including “La Robe de Rosalie,” “Joe Feraille,” “Le Reel de Melon d’Eau,” “Ton Meilleur Malheur,” “Si Tu Veux Ma Fille,” and “La Talle des Ronces”. The very talented musicians that make up T-Salé are: Jean-Jacques Aucoin (accordion, guitar, vocals); Louie Aucoin (bass, vocals); Dave Trainer (fiddle, vocals); Todd Aucoin (drums, triangle), and Richard Burgess (guitar, fiddle). T-Salé’s self-titled, debut CD earns our highest five-pepper rating.